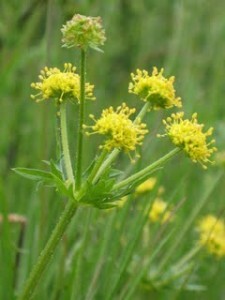 Additional Info: American sanicle is an herb growing in forests of Newfoundland, and spreading to Colorado, Alberta, and Georgia. A green-colored stem grows from a tough rhizome. There are hardly any leaves on the stem, the rare of them grow on petioles and are characterized by green-bluish color. White or yellow-colored flowers start blossoming at the end of spring and bloom through the summer period. Used For: The plant is widely known for its expectorative, healing and laxative properties. It’s potent of calming the nervous system down, boost one’s metabolism and fight diarrhea. Due to its healing capability the herb is applied for curing sores and inflammations in the mouth, and used as a rinsing for sore throat. Also applied to treat hemorrhoids, ulcers and reduce menstrual bleeding. When taken in powder the medicine is widely applied for chorea and recurrent fevers. According to Jethro Ross, the remedy is almost universal. It is very effective in purifying the organism and curing the wounds. Preparation and Intake: To prepare an infusion the remedy is taken in a quantity of 1 teaspoon, and infused on water. The result is drunk in a dose of 1 cup daily. In form of a tincture the remedy is applied in a quantity of 20 drops on average.